Katie Beckett Defied The Odds, Helped Other Disabled Kids Live Longer : Shots - Health News Katie Beckett, 34, died Friday morning in the same hospital where she once made history. Beckett spent most of the first three years of her life in an Iowa hospital because she needed to breathe on a ventilator much of the day. Medicaid would only pay for the expensive treatment if she stayed in the hospital. Her case led to a change in that rule. Katie Beckett, 32, inserts a small suction device into her tracheotomy tube to help clear her lungs and throat. Twenty-nine years ago, President Ronald Reagan heard about a little girl who had spent most of her life in a hospital. That little girl was Katie, then just three years old. Nurse Vicki Hagen comes over to Beckett's apartment in Cedar Rapids, Iowa, to help fit her with a vibrating vest that helps clear mucous from her lungs twice a day. Studies have shown that, almost always, it costs less to care for someone at home than in a nursing home or hospital. On the wall of her apartment are pictures of Beckett as a child with President Reagan. Reagan created the "Katie Beckett waiver" that changed the Medicaid rules to allow severely disabled children and adults to get government-funded care in their own homes. Beckett (left) and her mom Julie go to a restaurant in Cedar Rapids, Iowa, once a week to catch up. Beckett is now famous among children's advocates and travels the country with her mom working for laws and programs in favor of homecare. A few years ago, I asked a 13-year-old girl who was receiving care for cystic fibrosis on a Medicaid program known as the "Katie Beckett waiver" if she knew who Katie Beckett was. "Probably some kind of doctor," the girl said. It was a logical guess. But Beckett was another child with a significant disability, and she changed health care policy for hundreds of thousands of other children with complex medical needs. On Friday, Beckett, at age 34, died in Cedar Rapids, Iowa, of complications from her disability. Beckett had spent most of the first three years of her life living in an Iowa hospital because she needed to breathe on a ventilator much of the day. Medicaid would only pay for the expensive treatment if she stayed in the hospital. In 1981, President Ronald Reagan heard about her situation and changed the rule so she could go home. As Reagan noted, it cost significantly less — about one-sixth as much — for Beckett to receive the care at home, instead of in a hospital. When she was just 5 months old, she contracted viral encephalitis, a brain infection, and went into a coma. After recovering, she had partial paralysis that left her unable to breathe without a ventilator much of the day. At the time, federal officials figured there were, at most, one- or two-hundred children like Beckett around the country. Most of them were not expected to live very long. But since then, more than a half-million children have received life-extending medical care at home under the Beckett waiver. Improved medical technology, and close attention from nurses, aides and parents — all made possible by the funding — have allowed these children to grow up with improved health, despite having severe disabilities. Now the issue is that the state and federal waiver program ends by age 21, and children are outliving their generous health care. These disabled children are often leading pretty normal lives. Beckett did. She went to college. 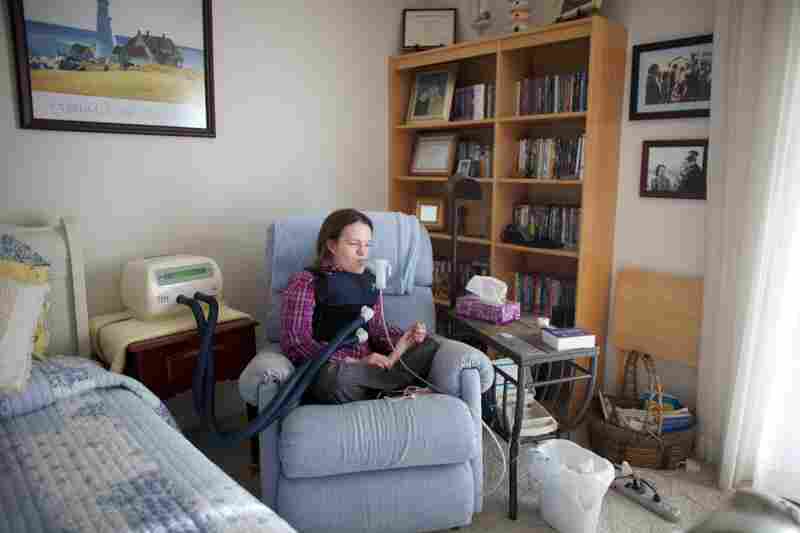 She lived in her own apartment, even though she still relied on nurses who, for an hour every night, arrived to give her breathing treatments. She still needed the ventilator to breathe, up to 15 hours a day. Still, living with complex health care needs is not easy. As Beckett explained in 2010 to a group of health care workers, "Just because you reach a certain age does not mean that you are miraculously cured of all the things you have endured." Over the past few years, she suffered from a series of illnesses and was forced to put off taking the classes she needed to get the teaching degree she wanted. There were many hospitalizations over the years, and her mother, Julie Beckett, said she often feared for her daughter's life. But Katie's death Friday was unexpected. She died in the same Cedar Rapids hospital where she once made history. Katie and Julie became known as national advocates for people with disabilities. On Katie's 32nd birthday, she and her mother were in Washington to speak to a meeting of child health workers. Later that morning, Katie, in an interview with me, said she valued being a role model but was happiest back home in Cedar Rapids, where she could lead an anonymous, normal life. "In Cedar Rapids, it's quite different," she said. "I'm the girl that they see drinking a latte at Barnes & Noble. I'm not the girl from the newspaper, from the television station." Sen. Tom Harkin, the Democrat from Beckett's home state of Iowa and one of the chief authors of the Americans with Disabilities Act, said Katie is a symbol of what the disability civil rights law set out to establish. "It's about making sure that we don't separate out people with disabilities, but make them part of the families, making them part of the communities, part of the schools — just an integral part of society. That's what Katie fought for all of her life." Joseph Shapiro is a correspondent for NPR News Investigations. Katie Beckett's story was part of the "Home or Nursing Home" series, which explored the struggle for the disabled and elderly to receive care at home.